Discussion in 'Online Games - News and Reviews' started by Marina, Apr 4, 2014. Enjoy a new Penny Slot release from WinaDay Casino called Sands of Gold. Penny Slots at Win A Day Casino are a great way to enjoy playing online without breaking your wallet and this one is sure a winner. The bonus round is plentiful and can make your play time last. 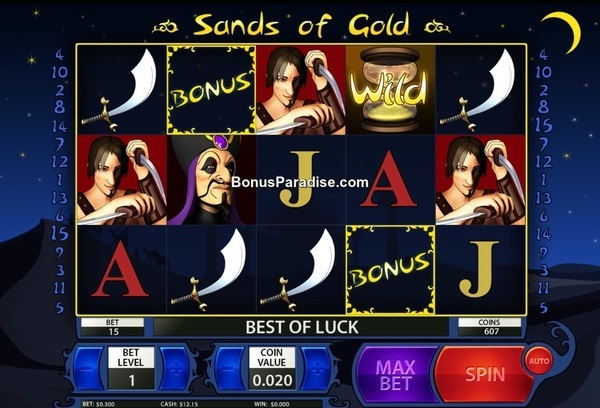 Sands of Gold is an Arabian themed video slot that is packed with adventure and allure. Journey into the desert to reap some riches playing this online video slot.The crisp and vibrant graphics will take you to a far away land and have you spinning your way to wins. Transpose yourself back in time and be captivated with a fantastic bonus round and an hour glass to bring you even more winnings. Simply inspired by the old time mystical venue of tales of the Arabian nights, this penny slot will become one of your favorites as you spin your own tale of nights in the desert. Sands of Gold is a 15 payline, 5 reel, 3 row penny slot that you play online. The game interface is very user friendly. Players choose their bet level and coin size by the + or - keys. There is an auto play button and a bet max button. On the upper right side of the page, players can find all the game info. All wins pay left to right. The hour glass is wild and substitutes for all symbols except the bonus symbol. To receive the pick me bonus round, receive three or more bonus symbols and where on the reels and you can pick your way to some great winnings. The three rounds include, Vase, Basket, Urn. Pick correctly and see your balance grow. The bonus round hits quite frequently.